I didn’t have a clue what to expect when I went in to this book, but I sure as heck didn’t expect this! How to describe this book…? I think the best description is that this is a ‘buddy book.’ Take a look at the title, My Best Friend’s Exorcism. The word “Exorcism” is likely to be the word that attracts attention to the potential reader, and certainly let’s a potential audience know what they’ll be facing within the pages, but it’s the term “best friend” that defines the story. It is the 1980’s. Abby and Gretchen are best friends and have been since elementary school. But once they get to high school something changes. Gretchen isn’t herself. She hangs with a different crowd. She teases Abby. She’s clearly … well, possessed. Why else would a best friend act so differently, right? But only Abby seems to see the difference in Gretchen … the possession. Until, that is, a troupe of evangelists visit the school and the entire student body is required to sit and listen to their presentation and one of the troupe members points … directly at Gretchen! … and says that he knows she is possessed. It’s all the proof Abby needs to focus her attention on getting Gretchen – her best friend! – the help she deserves. But by doing so, Abby’s grades drop. She is accused of malicious activities herself – activities that she has difficulty proving she didn’t commit – and it is Abby who appears to have changed upon entering high school, and not Gretchen. Not only must Abby fight for her friend, she will suffer to do so. The story rambles just a little bit as we wonder if this is a horror novel? A YA brooding story of lost friendships? Something else entirely? We spend just a little too much time getting the gist of Abby’s obsession with ‘fixing’ Gretchen and the effect it is having on her own life. This probably could have been cut in half and had the same effect. But the ending … man, this ending is strong! Tear-jerker strong! And completely unexpected. The scenes of the evangelist working to exorcise the demon from Gretchen are comic and heart-warming. I could only picture John Candy from the 80’s playing this role. And Hendrix plays this perfectly because we needed a little comic relief at this moment, but it never loses the integrity of the story or the sense of drama occurring during the scene. It’s a tricky bit of writing and Hendrix navigates it well. This is easily one of the best surprises I’ve come across in my reading in some time. It falls just shy of five stars because of the too-long set-up of Abby being consumed by the need to save her friend. Looking for a good book? 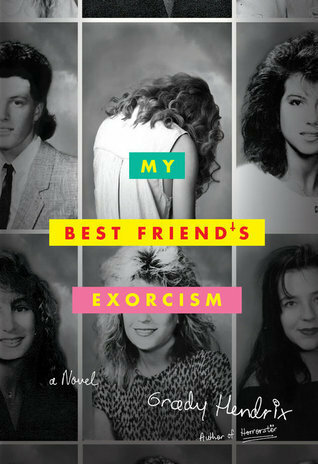 My Best Friend’s Exorcism by Grady Hendrix is a powerful, touching drama with a hint of supernatural that will have you reaching for tissues as you get to the end.